Spacious and bright apartment close to the beach with private garden and parking . If you are looking for a seasonal home away from home while in Cannes - your search is over. Experience the uniqueness of a 19th century environment and discover 'Villa Victoria' - a very special Victorian manor house, built in 1849 by the renowned architect Thomas Smith. 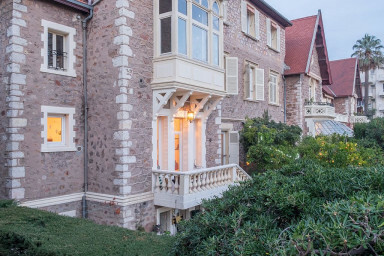 The house is a lovely example of when the Cannes area, benefitting from the influx of the English aristocracy, began the transformation from a simple fishing village to a world famous resort. This beautifully quiet and spacious two-storey apartment with high ceilings and large windows overlooking the garden and the sea is a real gem. The apartment is tastefully decorated and the well-kept garden with 200m2 of rose bushes, old orange trees and a barbecue, dining and relaxing area is also at your sole disposal. On the top floor there is a living room, bathroom with a toilet, fully equipped kitchen and a spacious bedroom with double bed. The wonderful flowering garden is the first thing you'll see in the morning. We have an AC unit on the top floor. From the living room, the glassed door leads to a cozy terrace and to the garden with a partial sea view. The living room also has a fold-out double sofa bed. On the ground floor there is a guest room with a double sofa bed, shower and toilet and a utility room with a washing machine. As this lower floor is partially below ground level there is no need for an AC unit but we've installed a modern almost silent fan to enhance the outdoor vacation feeling . We know you won't mind the flowers looking through the guest room window!